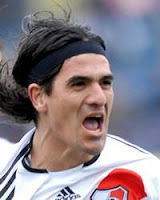 Ariel Ortega has suggested that he would be happy to return to River Plate following the resignation of Diego Simeone, but insisted that club president José María Aguilar would have the final say in any move. Simeone lost patience with Ortega, 34, after the playmaker missed a number of training sessions for various reasons, some of which were linked to his ongoing alcoholism. Ortega was banished from the River squad for the Apertura tournament and eventually signed for second division side Independiente Rivadavia. With Simeone having now departed, the path could be clear for Ortega to make a return to El Monumental, but he knows that a possible return is out of his hands. "Aguilar will be the one who decides whether or not I can return," he told Radio La Red. "The fans can request things, but the leaders may not listen to them."